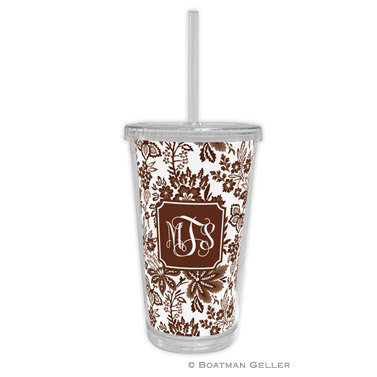 Chic and stylish 16 ounce beverage tumbler with straw from Boatman Geller. Enjoy your favorite drink style, perfect for home or office! Hand wash only. Personalization: Can be personalized with your choice of monogram, name or greeting (up to 3 lines). For monograms, please type as first, LAST, middle. Proofs can be provided upon request for a charge of $10.00. This includes two rounds of proofs by email. Please allow 5-7 days for production, plus shipping time. Click to view the Boatman Geller Typestyles. The color option is preset as shown. Please enter monogram, name or greeting as you would like it to appear.